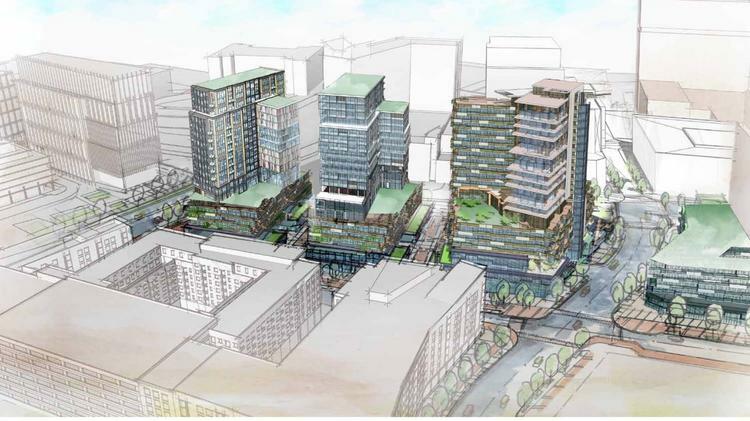 A local developer wants to mimic the success of Federal Realty Investment Trust’s Pike & Rose, a mixed-use development that turned a sea of asphalt into a walkable community in North Bethesda. VOB Development, owned by the Rankin family, has submitted plans to transform three blocks between Old Georgetown Road and Grand Park Avenue into what the company hopes will become a destination. The 5-acre site, owned by various LLCs controlled by VOB, is the former home to a Saab dealership, mobile phone retailer and a Capital One bank branch. Plans call for three residential towers totaling 1,000 units within walking distance of the White Flint Metro station. It also includes more than 110,000 square feet of restaurants, retail and offices lining the properties. Pedestrian walkways would lead to adjacent streets. The project is slated to go before the Montgomery County Development Review Committee on Nov. 20. The planning board must ultimately sign off on the project. D.C.-based PGN Architects is listed as the architect. If approved, construction could begin within two years, said Bradley Deckelbaum, a representative for VOB. The project is in keeping with the county’s White Flint Sector Plan, which aims to turn an auto-centric suburb into a pedestrian-friendly, Metro-accessible neighborhood, said Carrie Sanders, chief of Montgomery County Planning Department’s Area 2 division. She said VOB’s development is also significant because it would continue the road and pedestrian network established by Federal Realty’s (NYSE: FRT) Pike & Rose, a development that includes homes, offices and major retailers such as L.L. Bean, Sephora and REI.